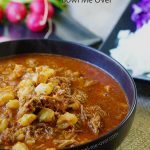 Authentic Posole - This recipe for posole is truly perfection in a spoon. Cooking it slowly renders a deliciously savory and flavorful stew. Add meat to a large Dutch oven (7 quart) and fill with water leaving a couple of inches from the top. Add bay leaf, salt, and garlic. Bring to a boil and continue to cook for 3-4 hours lowering the heat to prevent the water from boiling over. Add water if the water evaporates too quickly. When meat is tender and shreds easily add red chili sauce, chili powder and cumin. Break up meat into the bite size pieces (your preference). Add hominy and cook for an additional ½ hour to 40 minutes. Taste and add additional salt if needed.